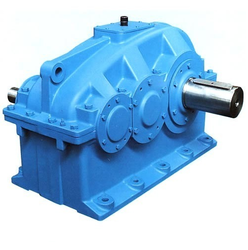 We have gained international acclaim due to our strict qualitative parameters in the manufacturing of Gear Boxes. The raw material we use is procured from some of the most renowned and reliable vendors and is stringently tested for quality before being used in the production process. We use latest technology and comprehensive quality control systems in manufacturing our products so that our customers get exactly what they want on customized requests. Venus Make Helical gear boxes one built on modular Concept of construction conforming to is standards with respect to sizes, dimensions. This provides economic mass production, comprehensive maintenance of stocks, favorable delivery period and easy of servicing. Today the position our company has achieved in industry is just because of our ability of manufacturing, supplying and exporting a premium quality range of Helical Gear Boxes. Optimum quality raw material and cutting-edge techniques are used by us in our manufacturing process, in order to cope up with the existing developments of the market. We also provide customization solutions according to the specific demands of our valuable client.